Is Discomfort the New Way Forward? Isn’t our expectation of companies today to predict the future? To invent what we don’t know we need, to know what we’re thinking before we think it, to give us what we desire before we even want? When they do, we line up to buy. Last week, PureMatter (the company Bryan Kramer and I co-founded) and IBM partnered together to put on our first-ever “Thinkathon” in New York to kick off three days of hacking the future of work, in conjunction with the launch of IBM’s new game-changing email solution, Verse. We identified 30 key “Futurists” – interesting thinkers from diverse industries, company size, and backgrounds, who are making an impact with their own work – to join together and question how we’re doing things now, what needs to be discarded, what could be changed, and how we can reimagine our own futures. Our keynote speaker, Faith Popcorn, was our choice to start the day. After all, her first book “The Popcorn Report”, released in 1991, predicted cultural monikers like “Cocooning”, and “99 Lives”. She is perhaps the most qualified person in America to shed light on the changing world, changing society and the changing marketplace, and we were eager to hear what her perspective was on what work will look like in 2025? 2050? Her track record is proven; a whopping 95% accurate, according to some pretty credible sources like Fortune and The New York Times. What she did present was… well… uncomfortable. Her version of the future is pretty dystopian. Robots have replaced the mundane, “commodity” tasks people are currently in charge of completing. Humans are further disconnected in physical spaces, yet more connected through technology. Our human lifespan is extended through extreme nanotechnology and biological discoveries that make immortality a possibility. There is a further division of the classes, and the emergence of a third “robot” class. Her description of the future left me questioning my own model of the future. I wondered, what happens to human psychology, biology and our ability to thrive and evolve in a society that rides the balance of control between artificially created minds and those born into our world, “the old-fashioned way”? According to Faith, we will not be able to tell the difference between the two. What happens to our need to connect physically and emotionally with other humans in a family unit, a community unit and global unit? I was not the only one in the room questioning her predictions. People squirmed. Voices elevated. And after the final applause, this previously loud, talkative group of Futurists got quiet. The thinking had begun. When we broke out into smaller discussion groups immediately after, something magical happened. People started asking questions about what we could do as humans, to prevent these things that made us uncomfortable from happening. We don’t want to be replaced by robots after all, yet we want to be more efficient and productive in our jobs. How could we do that? We want to be healthier, happier and more connected to each other, but we also want it to be easier, more accessible and less expensive to get it. How do we make this happen? When faced with a cold, inhuman future, it sparked the humanity in all of us to fight back – for balance, for ease, for connection, for trust, for something greater than ourselves. I loved how uncomfortable Faith Popcorn made us feel. She literally “broke” our brain’s traditional thinking pattern. We were reminded that the future is not a destination, but something that as humans, we shape along the way, in any way we choose, collectively, or as individuals. We were reminded that the only way for us humans to really think through what a new truth could be, is to get outside our comfort zones. Only there, is where we start asking questions – the messy, provocative questions that spark conversations that matter and birth new ideas – instead of preaching our comfortable platforms, or sharing what we already know to make ourselves feel validated and important. Faith’s new book, to be released late 2015, is titled “The Popcorn Report 2025: A Leap of Faith”. Having heard how she looks at things today, it makes me wonder what “faith” she will be asking the human race to invest? Or is the title just a clever play on words to validate her new predictions? Only time will tell. The Future of Work won’t be solved in an afternoon, or three days. But a critical conversation was sparked this past week – not just for 30 Futurists, PureMatter or IBM – but for all of us who care about work, our future, and how humans fit into all of it. I personally don’t believe the future has to be “either/or”. I think companies like IBM, that are actively starting these conversations and are willing to live outside their own comfort zones to build their own technologies with humanity in mind, get that humans and business go hand in hand. Anyone mindful of this will emerge out front. How will we shape our future of work? At the end of tomorrow, the choice is really ours. 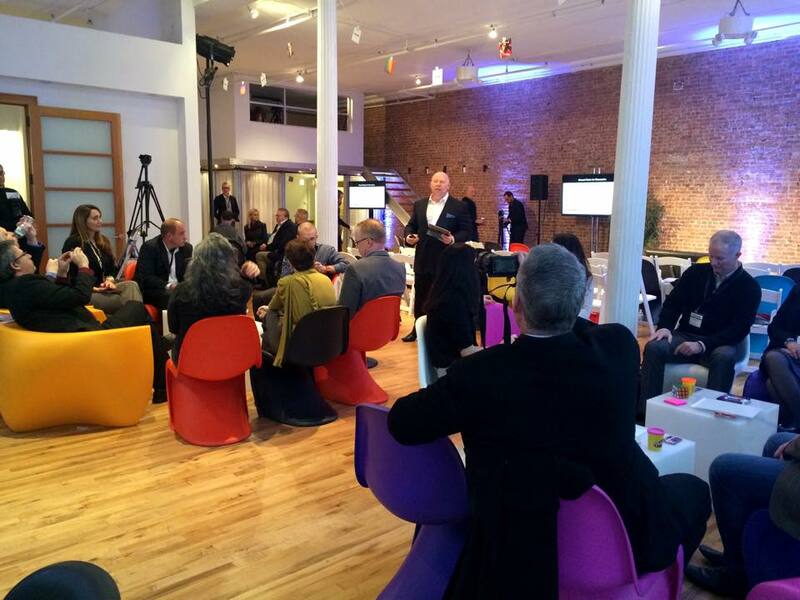 You can use #NewWaytoWork across social to be included in the broader IBM conversation. Special thanks to Faith Popcorn, Hendre Coetzee (our amazing moderator), our IBM Social Business team and all our Futurists who played full out this past week, I can’t wait to keep the conversation going!